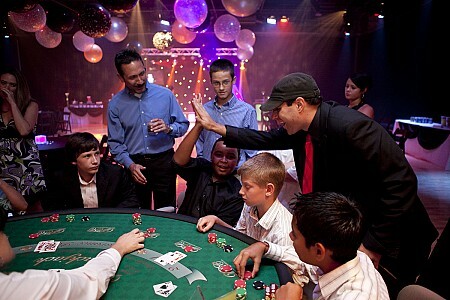 Perfect for corporate events of themed parties, we offer multiple casino tables in various styles. Whether your favorite game is craps or blackjack, roulette or poker, we can bring the excitement of Las Vegas to your special event. If you really want the “wow “factor, consider our beautiful LED casino tables: black and white deluxe casino tables illuminated in color-changing LEDs for an effect that would make Vegas jealous! We also have casino-themed décor to take your event to the next level, including LED Curtains, lighted dice, oversized playing cards, and casino-themed gobo projections. All of our casino packages include properly-attired dealers, chips, and custom-designed funny money.